The First Unitarian Church, built in 1838 (New Bedford Whaling Museum Photo). The First Unitarian Church on 71 8th Street was a joint effort between architects Russell Warren and Alexander Jackson Davis and physically built by the brothers William and Seth Ingalls, for the low, low price of $40,000. Russell’s official title in the project was as a building supervisor. Warren was the first to submit designs for the first year, but eventually Davis came aboard and it said his influence on the fortress like church is more in line with his work, for example the Athenaeum in Hartford, Connecticut and Lyndhurst, New York. 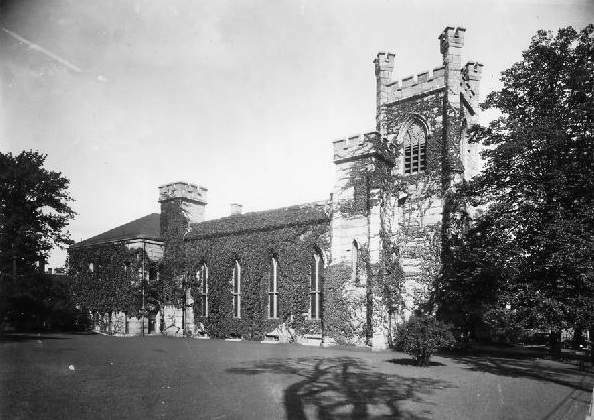 It was built in the Norman Gothic style or Early Gothic Revival style depending on who you ask and required 7,000 tons of granite. The church itself was established in 1708 in “Olde” Dartmouth, before making its way to the corner of Purchase and William Street in 1824 as the First Congregational Society of New Bedford. In 1868 a chapel was attached to the church which served as a meeting house and Sunday school. In 1874, she underwent some major renovations. In 1896, the Parish House was built in the rear. The Whaling Museum currently possesses original plans. The Joseph Grinnell Mansion at 379 County Street (New Bedford Whaling Museum Photo). The Grinnell Mansion as it is colloquially known, was built for business man and Congressman Joseph Grinnell. 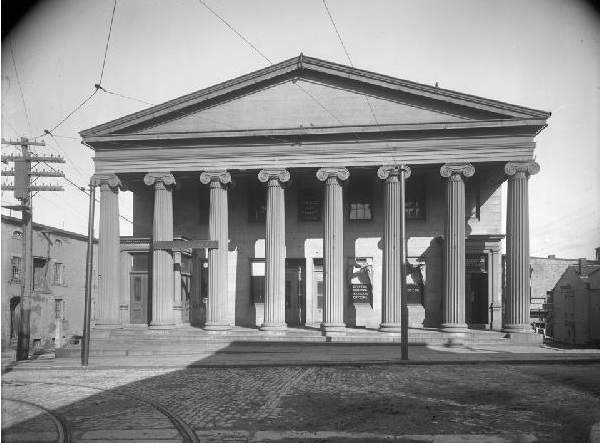 The Greek Revival style building at at 379 County Street was built in 1830, and features the Doric columns that are seen on the Double Bank Building. These columns were destroyed in a fire, but eventually replaced. A third floor was added by an heir in 1893. Interestingly, the outer sheating was cut from the same quarry that Boston’s Bunker Hill Monument was built from. Grinnell at one time used the mansion to host former President John Quincy Adams in September of 1843. While he began in the seafood business, he was the pivotal to New Bedford building its first cotton cloth-manufacturing complex, the Wamsutta Mill. WHALE came on the scene in 1987 and renovated the deteriorating building, which had been completely abandoned for three decades. Today it is the Congregate Home for the Elderly. City Hall and Library have switched original locations (New Bedford Whaling Museum Photo). The New Bedford Public Library was another building that Warren worked with the Ingalls brothers on. The federal government had a surplus revenue in 1837 (imagine that!) and distributed some of the funds to the city of New Bedford in 1838. 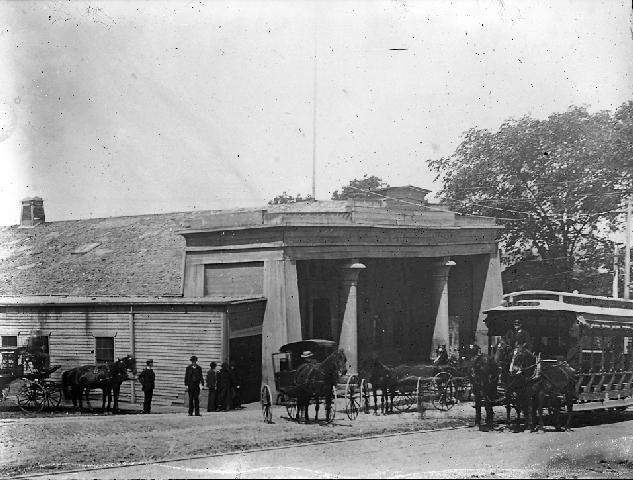 The original idea was to build a new market, but in a follow up meeting decided to take the government’s funding of $40,000+ and add an additional $12,000 for “…the erection of a Town Hall and Market House on William Street.” The lowest floor was used as a market, the ground floor as a hall, and the top floor for city offices. The now (in)famous story, known by any historian, amateur and professional alike, is that a fire in December of 1906, forced the City to take over the Library across the street to continue operations. After the damage to the building was repaired, the library decided to move in. Pearl Street Train Depot in Egyptian Revival Style (New Bedford Whaling Museum Photo). The Pearl Street Depot has the glorious distinction of being the first train station built in New Bedford. It was located just east of Purchase Street. Built in the Egyptian Revival Style it was dubbed “The Tombs” because of its similarity in appearance to the entrances of Egyptian catacombs. As is a common theme with Warren, there were columns at the entrance, four in this case. Rather small, it only had two departures and arrivals a day initially, from New Bedford at 6:30 a.m. and 3:15 p.m. leaving Boston on the return with a stop in Taunton before arriving in New Bedford at 7:00 a.m. 4:15 p.m. As the railroad was extended throughout the region it gained in popularity and usage. So much so, that it was replaced with a much larger depot in 1886. 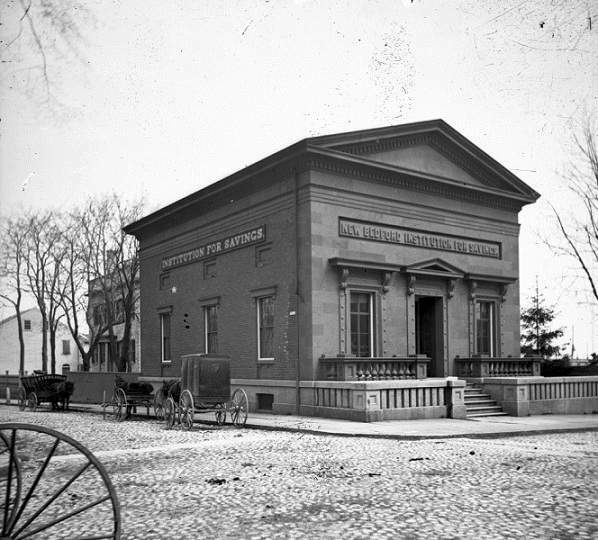 The National Institution for Savings before it was owned by the NPS (New Bedford Whaling Museum Photo). 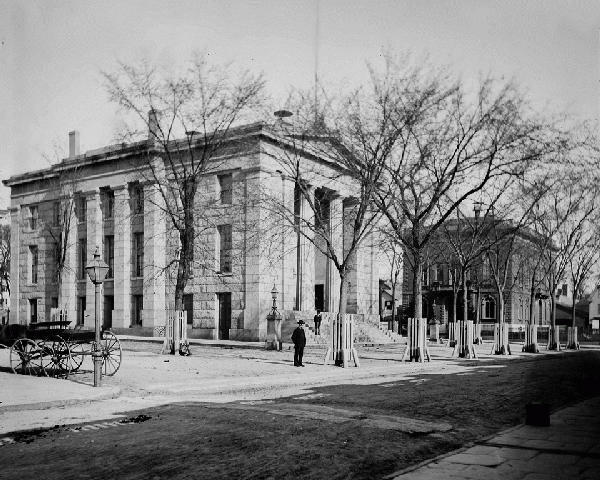 The Old Third District Courthouse, located on the corner of Second and William streets was another Greek Revival style building, albeit without the columns that Warren seemed so fond of. While everyone knows this building as the New Bedford Whaling National Historic Park building or “the Visitor’s Building”, it was originally the New Bedford Institution for Savings or NBIS. When whaling busted, and textiles replaced it, the bank relocated further downtown in a larger facility. The Bristol County Courts then moved in and to this day the pediment states “THIRD DISTRICT COV[U]RT OF BRISTOL.” As the population grew, so didn’t the criminal element and the building was simply too small. The courts relocated in 1896, and the building then went through a variety of incarnations including an auto parts store and an antique dealership. In 1995 Fleet bank and WHALE came along and did their wonderful thing in renovating the building before turning it over to the National Park Service. Rodman Mansion – One of America’s most expensive homes in the 1830s (New Bedford Whaling Museum Photo). 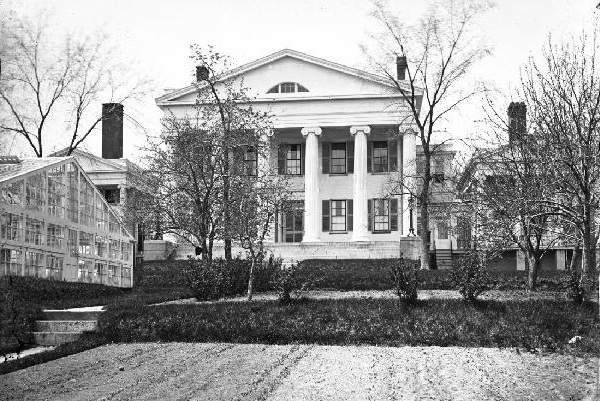 Located at 388 County Street, the William R. Rodman Mansion or “Rodman House” was built in the Greek Revival style that Warren loved. Of course, it had the his favored Doric columns as well. It was designed for aristocrat, bank president, William Rotch Rodman and was considered “the most stately mansion in New Bedford” in its day. Indeed, it was considered one of the most expensive homes in America in the 1830s. When Rodman passed away in 1855, the mansion passed from one famous family after another, beginning with New Bedford’s first mayor Abraham Howland. For a number of years it passed from Howland, to Grinnell, to mill mogul Joseph Knowles who built an addition onto it in 1909, then to John Gael Hathaway. 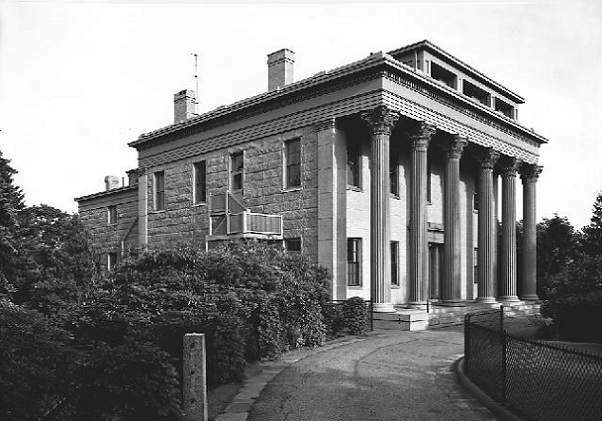 Self-made millionaire, and owner of Dartmouth Mills, Walter Hamer Langshaw purchased the house and spent years renovating and building additions, including an organ loft, mosaic floor, Georgian plaster-work, and a facade solarium. In the 1950s it became the New Bedford Jewish Federation’s community center. In 1972 it went to the Swain School of Design, and finally its last owner William Rodman Partnership in 1988. The John Avery Parker Mansion built in 1834 (New Bedford Whaling Museum Photo). 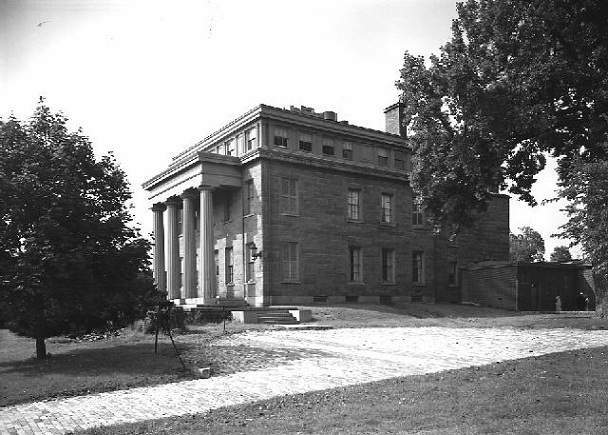 Dubbed “the most imposing house ever built”, this Greek Revival mansion was similar in many ways to the Rodman Mansion and like the Rodman mansion, was also on County Street. It was bounded by County, Pearl, State and Willis Streets. Surprise, surprise, more doric columns! Mr. Parker paid $100,000 in 1834 to have this mansion built. Mr. Parker passed away in 1853, when Wamsutta Mills superintendent Thomas Bennett purchased it. His daughter sold it in 1902 and it was promptly – and sadly – demolished, except the south wing on Willis Street. As always, special thanks go to the New Bedford Whaling Museum for generously allowing us to use these great, vintage photos. If you enjoy these photos, there are plenty more in the museum and on their online database. You will find a number of photos of these buildings in various stages.